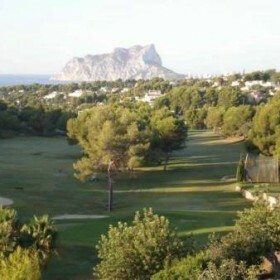 The Ifach golf course is situated in Moraira (Benissa) on a country estate that offers you the best views in the Valencia region. 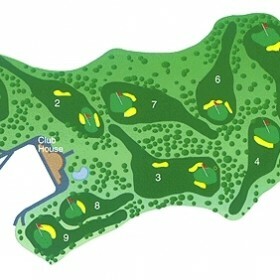 It has a round of nine holes (6 par-3’s and 3 par-4’s) and even though the holes are short, the terrain and the narrow fairways make them quite difficult and technical. 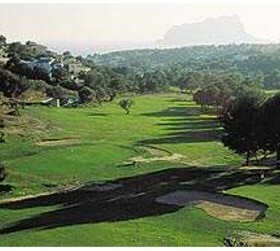 However, two rounds can be managed easily and you will be able to enjoy your game while admiring the view of the Peñón de Ifach rock and the sun sparkling on the Mediterranean Sea. The position of the trees and bunkers makes some holes more difficult and introduces variety into how the holes have to be played. The course was designed in such a way as to make it necessary to use all of your clubs. It requires great control, not only on the drive but also in the short game. The round is not too hard for beginners, nor too tiring in the summer season. Because of its short holes, Ifach is popular amongst older golfers and people who don’t have the time for long rounds of golf.